We think you enjoy our Ferrari products services Page. 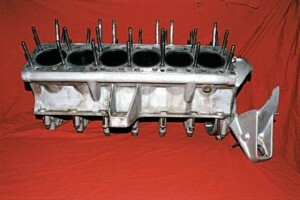 This photo shows a set of Ferrari 355 stainless steel aftermarket headers. We build our headers with 321 stainless steel U bends. We C.NC. machined round to oval stainless steel exhaust flanges. All joints T.I.G. welded with argon back gassing. Scroll down to see all of our Ferrari products services. We can do Ferrari engine aluminum block repair and machine work. We build Ferrari aftermarket billet main bearing caps. We will build billet main bearing caps for any engine. 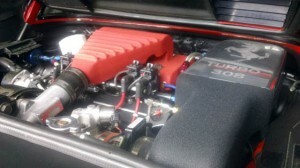 Our Ferrari 308 E. F. I. turbocharger system is an excellent example of a complete prototype aftermarket E.F.I. turbo system. We have built turbocharger components or complete systems for high performance cars and boats since 1974. Currently this car only makes 335 uncorrected rear wheel h. p. This car starts easily in zero degree weather. With a full tank of pump gas, two people, the air conditioner on, we average 20 m. p .g. @ 65 m.p.h.. Our 308 Ferrari E.F.I. turbocharger system has no turbo lag and pulls off high gear from 1100 r. p .m. 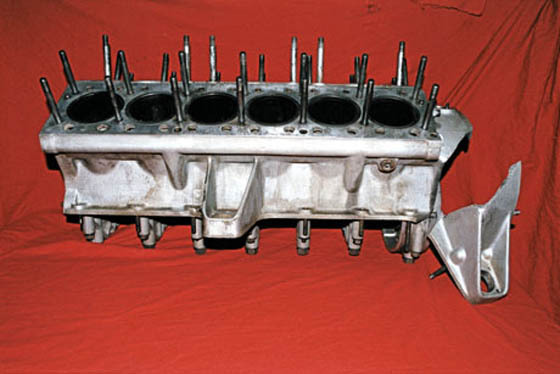 We finished these vintage Ferrari reproduction cylinder heads 15 years ago. 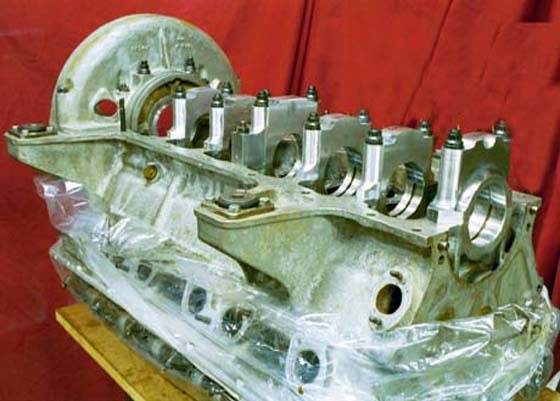 We machine cylinder heads from raw castings. 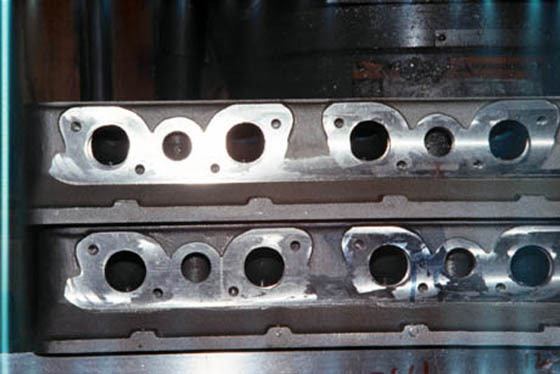 We can also work with foundries to build new patterns to cast new aluminum cylinder heads. 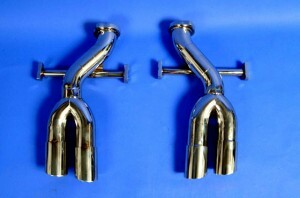 We build Ferrari 360 aftermarket tail pipes. We use 2.5 inch o.d. .065 thick 304 stainless steel tubing. Our C.N.C machined stainless steel flanges are exactly the same as the original flanges. We back gas the tubes with argon using an independent tank and regulator. We build our tail pipe tips using 2.75 o.d. 1/8 wall stainless tubing. See more of our Ferrari products services in the next photo. 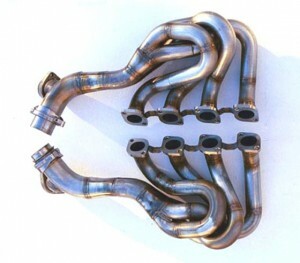 Our Ferrari 550 stainless steel tail pipes are one of the many Ferrari products services we offer. We use 2.5 inch o. d. .060 thick 304 stainless steel tubing. Our C.N.C machined stainless steel flanges are the exact same size as the original flanges. 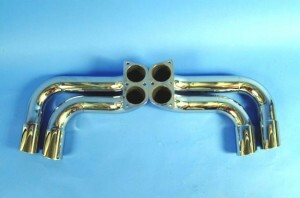 We build our tail pipe tips using 2.75 o. d. 1/8 wall stainless tubing. We back gas the tubes with argon using an independent tank and regulator. 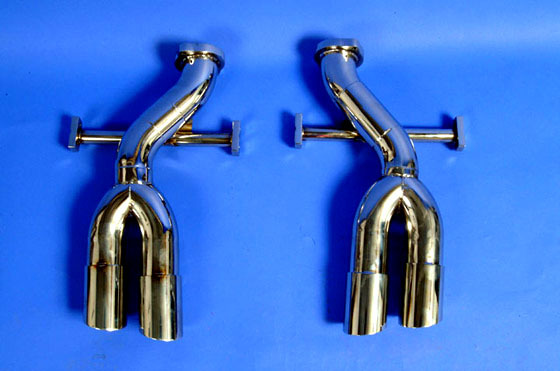 We build custom tail pipes or complete stainless steel exhaust systems for any car. I built this Ferrari 512 B. B. replacement stainless steel exhaust system while employed at a now defunct company. I built the model System. I built the welding and bending fixtures after consulting with the tube bending house. I used 1.75 o.d..049 wall thickness 321 stainless steel tubing. 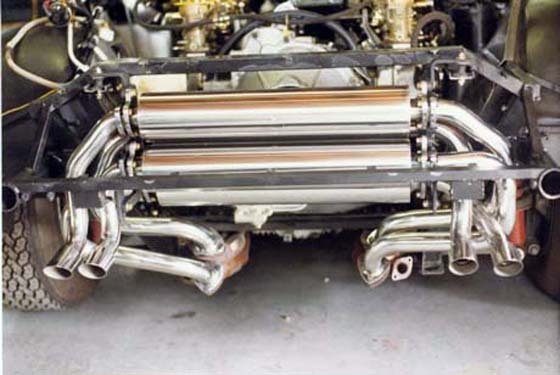 I designed this system so that the catalytic converters could be unbolted and replaced with either straight pipes or straight pipes with resonators. Please call with any questions about our Ferrari products services.